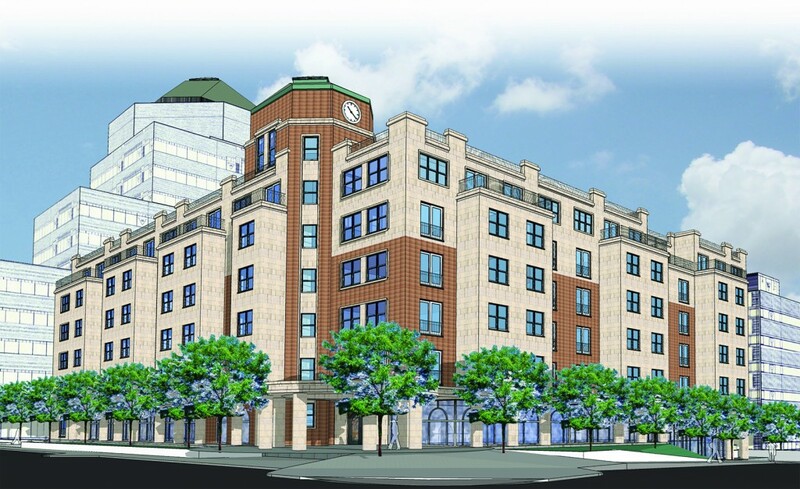 A groundbreaking ceremony was recently held in Middletown, Connecticut for the College Street Apartments. Northeast Collaborative Architects designed the six-story, 93-unit apartment building for their client Hajjar Management. Comeau and Kelly Construction, Inc. will build the project. College Street Apartments are located at the corner of Broad and College streets near the 12-story Middle Oak office tower that is owned by Hajjar Management. NCA’s plans for the apartment building include an L-shaped building that will face Broad and College streets. The ground level will feature 2,500 square feet of commercial space along College Street. The upper stories will house a mix of studio, one-bedroom, and two-bedroom units.